Life often seems like a losing battle. The church season of Lent reminds us of the dangers we face—and how often we’ve been defeated. Yet before you lose hope, look to Christ, who brings you total victory by his own victory for you. As the Apostle Paul once wrote, “Victory is ours through our Lord Jesus Christ!” On Sunday, we took a closer look at Romans 8:1-10 and learned how Victory Is Ours Over Sin's Control. The following devotion is adapted from that sermon. For the entire text of the sermon, visit here. “It’s my life, and I’m going to live it the way I want.” When it comes to your life, you want to be in control. You want to be in control of the decisions you make. You want to be in control of what goes on in your life and how others perceive you. You want to be in control of the food you eat, the clothes you wear, the vehicle you drive, the home where you live, the products you buy, and the profession you take up. You may even try to control the uncontrollable—things like the effects of age, the struggle for good health, and even death itself. We all do that because none of us likes to be in a position where we have little or no control. Without control, we are left to the control of others—and that’s frightening! Yet for as much as we think we’re in control of our own lives, none of us really is. You see, there’s a daily struggle going on for control of your life, a struggle between your sinful nature and your spiritual nature—your Christian faith. Your sinful nature wants to control you like a slave or a beast of burden. The Spirit of life wants to grant you freedom through faith in your Savior Jesus. This daily struggle is messy and ongoing, but even here, through Jesus, victory is ours over sin's control! Only one who was God himself could be perfectly free of the control of sin and death. So God sent his holy Son in your likeness not to be another tyrant, but to be your Substitute to joyfully and willingly carry out God’s holy will in every thought, every word, every action. In your place, he had pure and decent thoughts. In you place, he was perfectly content and took the words and actions of others in the kindest possible way. In your place, he humbly served his heavenly Father, not grudgingly as a slave, but joyfully as his Son. Sin and Satan tried to tempt Jesus to get him to submit to their control, but the holy Son of God fought them off. By doing that, he destroyed their control over you. Ultimately he did that by making his way to the cross to die—not for his own sins, but for yours and mine and those of all people. By doing that, Jesus dealt with your sin. When the holy God looked at his Son on the cross, he saw your sins and mine, your hostility, your lust, your greed, your secret sins, your public sins, and all of mine too, and he condemned them in Christ. “God condemned sin in his flesh, so that the righteous decree of the law would be fully satisfied in us who are not walking according to the flesh, but according to the spirit.” Jesus satisfied God’s requirements. He faced the full punishment for our sins. Now in Christ, you are free for “there is now no condemnation for those who are in Christ Jesus.” Freed from the control of sin, you and I are now controlled by the “Spirit of life.” Instead of serving your sinful nature, now you serve the Lord of life--and that's a great thing! The Holy Spirit guides you into life and peace. He guides you in life as you humbly serve your neighbor in the daily callings God has given you. Now you no longer serve yourself, but serve the ones whom God has called you to serve. In that way, as your faith focuses on what God desires, you serve as God’s hand of blessing for that loved one who needs to be encouraged, that co-worker who needs to be defended, that customer who needs to be served, that child who needs a healthy meal, that spouse who needs to be supported and loved, that neighbor who needs your help, that friend who needs Christ. Your life is not your own. You were bought with the blood of Christ. So live and serve freely in Christ, Friends! Hope Grows! (Sunday AM Bible Study!) – Why does Baptism matter for me now? What do I receive in the Lord’s Supper? Why does it matter that I attend church? 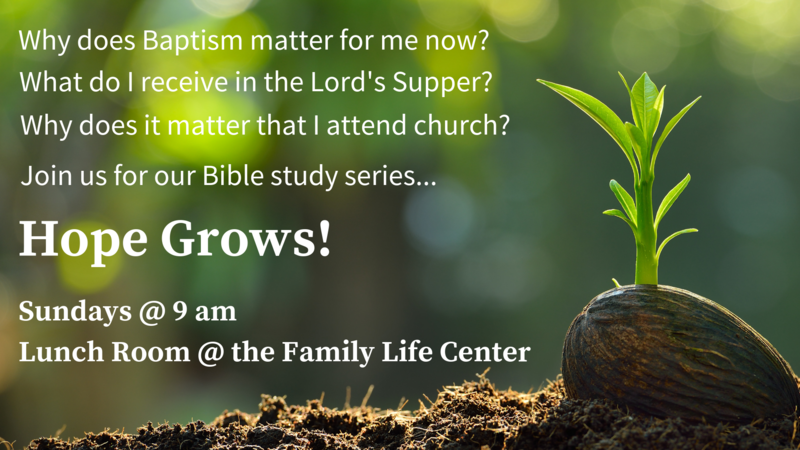 Join us Sundays @ 9 am as we dig deeper into what God’s Word has to say about these questions and many others! Raise Your Voices This Easter! - We are forming a family choir—men, women, and kids—to sing a couple pieces for our Easter Festival Service. Join us for practices after worship on Sundays through April 14 and this Wednesday, April 10 @ 6:30 pm. If you are interested, please contact Randy Cochran or join us in the balcony for practice! Good Friday Singers Needed - We would like to have a group of singers sing "Lord, Let at Last Your Angels Come" at the conclusion of our Good Friday evening service on April 19 @ 7 pm. If you are interested in participating in this way, please contact Pastor! Christ Has Set Us Free! 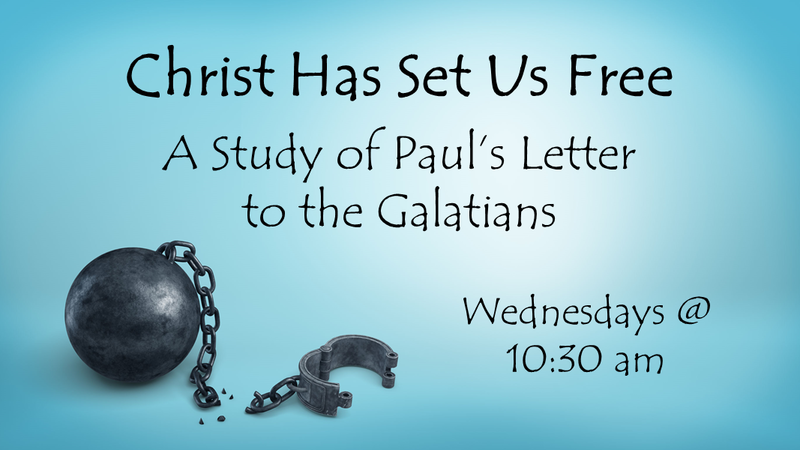 – Join us Wednesdays @ 10:30 am, as we dig into Paul’s letter to the Galatian Christians and find out how true freedom can only be found in Christ and his Word! We will be meeting in the conference room. Our Lenten Journey Continues! – Our midweek Lenten series—Three Words of Truth—continues this Wednesday @ 7 pm with a Lenten dinner @ 6 pm. All are welcome to attend! Gift Bag Assembly – After worship on Sunday, April 14, the Evangelism Team will be assembling thank you gift bags for our first-time worship guests. If you would like to help with this effort, please be sure to stop by the Conference Room after worship. Nathaniel’s Hope – The students and staff at King of Kings will be involved in activities promoting the Nathaniel’s Hope Foundation during Holy Week (April 15-19). If you would like to make a donation towards this foundation, please drop it off at the church office by Easter Sunday. Thank you for your consideration! Nathaniel’s Hope was founded in 2002, after 4-year-old Nathaniel Kuck passed away. His parents, Tim and Marie Kuck, experienced firsthand how demanding it can be to raise a child with special needs. Over 14 years later, Nathaniel’s Hope is still thriving, growing, and dedicated to providing hope and practical assistance to kids with special needs (VIP Kids) and their families. Subscription Renewals – Two publications from our church body—the monthly news magazine, Forward in Christ, and the daily devotional, Meditations, are available in print and electronic formats! To order online, visit NPH.net/FIC or NPH.net/Meditations. You can also call 1-800-662-6093. If you would prefer to place your order through the church, order forms are in your mailbox or are available from the church office. Return your order form to Dawn Todd by April 21! VPK/Pre-K – We are planning to offer VPK/Preschool for kids ages 3-4 during the 2019-20 school year starting this fall. More information will be available soon. If you or someone you know is interested, please contact the church office! Upcoming Summer Camps - Making plans for the summer? There are a number of summer camp options here at King of Kings, in the Orlando area, and in the Southeast for kids to connect this summer with your Savior, his Word, and his people. Check out below what's coming up! 1. King's Camp - King of Kings is once again offering our Christ-centered summer experience for kids ages 4-13. Our theme is Built on Jesus. Daily we study God's Word, play games, create crafts and projects, learn, and exercise. Weekly we participate in fun field trips around the Orlando area. Registration: Click on the logo above to register or visit VisitKoK.com/KingsCamp. You can register for 1-10 weeks of the camp. More info is available at the website! 2. City Camp - This camp is offered by the Florida congregations of our sister church body--the Evangelical Lutheran Synod. It is a camping camp at Bill Fredrick Park from June 9-11 for kids in grades 5-8. The camp includes 2 overnight adventures, Bible studies, swimming, outdoor activities, and meals. If you would like more information, please speak with Pastor or Dawn Todd. 3. 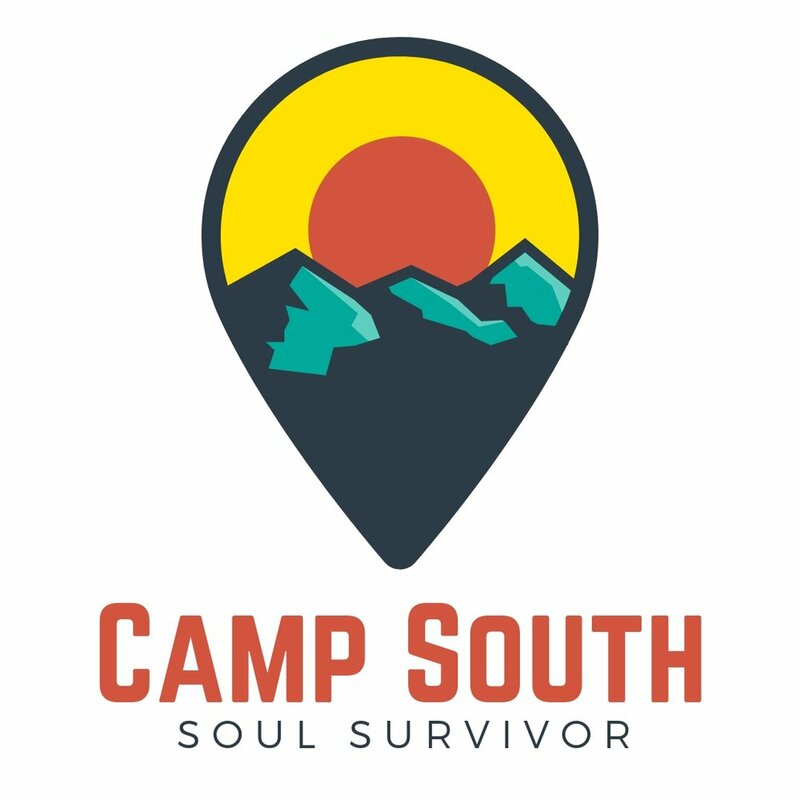 Camp South: Soul Survivor - "The most fun you’ll have this summer. Incredible activities (tough mudder, zip line, inflatables, massive group competitions), next-level worship, and more new friends than you can count." Registration: Click on the logo above to register or visit SADCamps.com/Camp-South. 4. 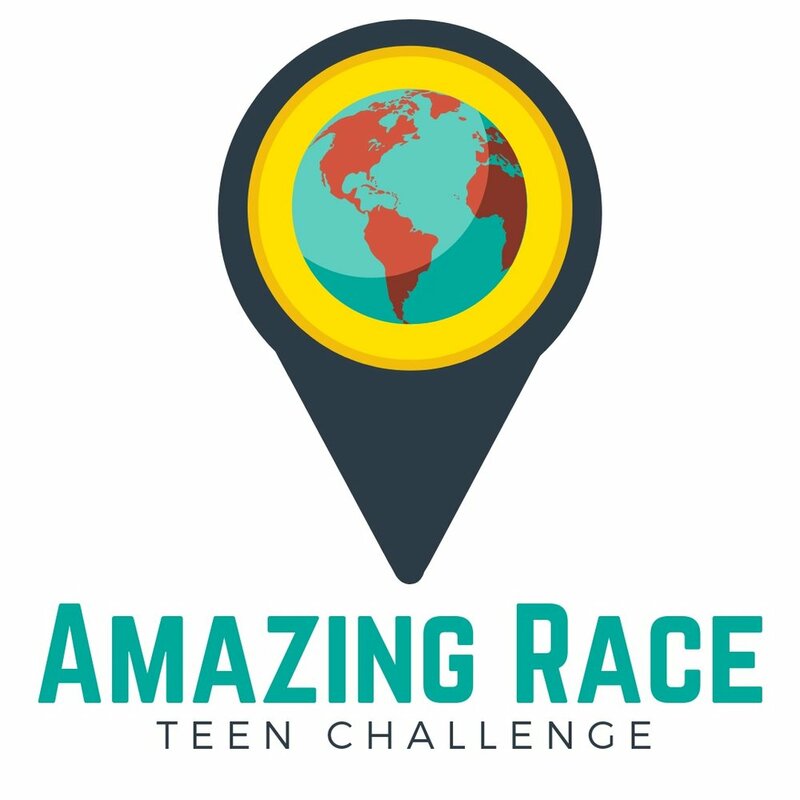 Amazing Race: Teen Challenge - "The most fun you’ll have this summer. A team scavenger hunt through an Orlando theme park (Disney or Universal), inspiring keynotes, an amazing resort, and a great chance to grow with people at the same point in life’s journey." Ages: Youth ages 14-19 who are entering grade 9 (in the fall of 2019) or finishing grade 12 (graduating in the spring of 2019). Registration: Click on the logo above to register or visit SADCamps.com/Amazing-Race. Every Member Visits - Pastor Gumm is visiting all of the members of our congregation. Please be sure to reply to this e-mail or speak with Pastor to schedule your visit!